"A dazzlingly simple and delicious recipe. This is an elegant dish to serve drop-in dinner guests." In a medium saucepan, melt butter over medium low heat; add wine, cheese, garlic, parsley and salt and pepper to taste. Simmer over low heat for 3 to 5 minutes, stirring frequently. Editor's Note: If you saw this recipe in the "Vegetable Insurgency" article in the Jun/Jul/Aug 2015 issue of Allrecipes, we added 5 ounces of baby spinach to it. 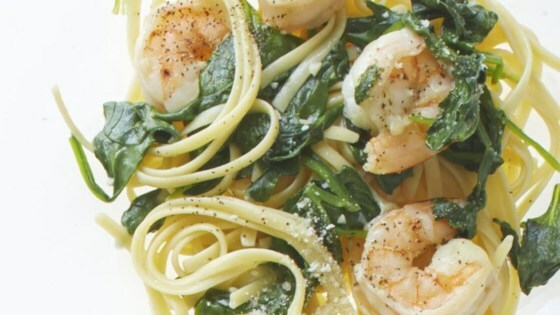 If you want to add more greens to this dish, add the spinach after you start cooking the shrimp. Then remove the pan from the heat so the spinach wilts and the shrimp don't overcook.